**ANOTHER NEWS FLASH!! * The Conference Room is back! The renovations are (finally) complete and we are now accepting reservations for the use of this space. We can set the room up with tables for working conferences and/or catered events, or for larger groups we can use “lecture room” seating. We have multi-media presentation capability as well as white boards and posters for brain-storming sessions. 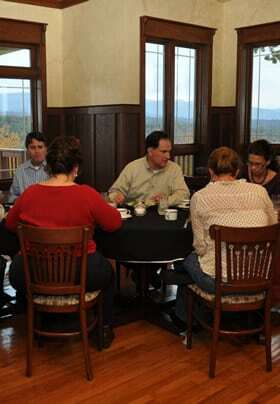 Lucille’s Mountain Top Inn & Spa, located an easy-to-travel distance from Atlanta, is ideally suited to host small meetings like corporate team meetings, off-site retreats, or small meetings by government organizations that require a budget-friendly site. Our site is also perfect for hosting family reunions, book clubs, religious groups, quilting groups, and scrapbooking clubs looking for the intimate surroundings of a small country inn that also offers modern facilities and amenities. 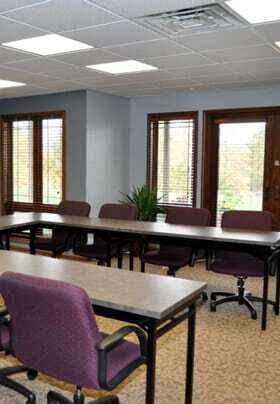 Call us at 706-878-5055 to discuss your meeting needs, rates and availability. Convenience – Our inn is an easy drive from Atlanta, Greenville, and the greater Northeast Georgia Mountains region. Far enough for an off-site meeting, but without the headaches of a long travel day. Service – Our staff provides a level of personal service difficult to find in one of those big-city hotels and not always executed well by some small hotels and inns. 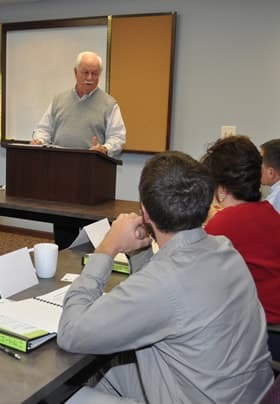 Value – Our location and facility are top-notch, but because we’re located outside of a large metropolitan area our value is outstanding and that will help you produce a quality meeting without the high price tag. Meeting Productivity – Our meeting facilities are ideally suited for small team meetings and provide the comfort that you need to be productive during those long planning sessions. Located on the terrace level, the meeting room windows overlook the Koi pond and Gazebo garden, and have French doors to the patio overlooking the Blue Ridge Mountains. Luxury – Our guest rooms are tastefully furnished, our bed linens are wonderfully soft, our towels are plush Turkish cotton and we use only organic bath amenities. The Inn’s common areas are elegantly furnished in the arts and crafts style, and are comfortable for casual gatherings before and after your meeting. The Food – Our gourmet breakfast is prepared every day using fresh ingredients that are sourced locally when available and our evening desserts are a great way to end the day. We also work with select caterers to provide your meeting with the best in food service to keep your team satisfied and focused. The Spa – The Spa at Lucille’s offers the finest in facial, massage, and skin care services. Perfect for de-stressing after a meeting or for guest accompanying meeting attendees. The Area – Opportunities for outdoor activities abound in the North Georgia Mountains once your meeting is complete. Several outstanding wineries are also located within a few miles and there are numerous galleries and shops in the Sautee Village just below the Inn. Relaxation – Our wide back porch and deck are equipped with swing, rockers, and outdoor dining tables that are perfect for overlooking the mountains while you unwind after a meeting. And for the ultimate relaxation after a long day of meetings, evening appointments can be arranged at The Spa. Beauty – You can hold a meeting at lots of places, but no one in this region has all of the above and the outstanding mountain and valley views that we have. Lucille’s Mountain Top Inn & Spa is ideally suited for hosting family reunions and groups of friends traveling together for a relaxing weekend. Our comfortable guest rooms and warm, inviting atmosphere provide the perfect environment for your family to bond and renew, or for a group of friends to socialize and relive old times. The common rooms, back porch and deck overlooking the Sautee Valley provide ample area for casual gatherings of family or friends while staying at the inn – which is why we hold our own family reunion here as well! Our inn provides a much more personal experience for your next reunion or weekend gathering of friends than can be found at a chain hotel, without all the housework of renting a cabin. Interested in learning more about meetings and events at Lucille’s? Give us a call at (706) 878-5055. This is the 2nd time we have had our annual seminar at Lucille’s and, again, Jim and Jerry did not disappoint! The meeting room is comfortable, guest rooms are superb, and the location, with its mountaintop views and the nearby restaurants for our attendees, was just what we needed. Thanks for the great service, scrumptious breakfasts and delicious munchies! We’ll be back next year.